Albany Area Metropolitan Planning Organization (AAMPO) was established in 2013 to facilitate regional transportation planning for the greater Albany Area. AAMPO members include the Cities of Albany, Jefferson, Millersburg, and Tangent, as well as Linn and Benton Counties and the Oregon Department of Transportation. Metropolitan planning organizations (MPOs) are established by Federal directive for all urbanized areas with a population of 50,000. Click HERE to access the AAMPO Policy Board member list. A Title VI / Nondiscrimination Plan and program. Para información en Español, haga clic aquí: Sobre AAMPO o contacte 541-924-8405. AAMPO adopted its first Regional Transportation Plan (RTP) in May 2018. The RTP outlines transportation improvements for the Albany area over the next 20 years. Click HERE to access the RTP. The purpose of the RTP is to plan for transportation improvements such as roads, sidewalks, bikeways, and transit. The RTP examines what exists today, forecasts demand, analyzes future options, and makes recommendations for a balanced and efficient transportation system. The project also collaborates between agencies and jurisdictions, builds on good decisions that have already been made, and creates a common vision for the future of transportation in the area. During the planning process, AAMPO also facilitated development of a Transit Development Plan (TDP) for the Albany area. Click HERE to access the TDP. Do you have a concern or comment? If you would like to submit a question or complaint regarding AAMPO planning or programming activities, please contact Dana Nichols at dnichols@ocwcog.org; or visit the AAMPO administrative offices at: 1400 Queen Avenue SE, Suite 205, Albany, OR 97322. If you have a concern or complaint related to the Title VI of the Civil Rights Act of 1964, please see our Title VI Program webpage for additional information and a copy of our complaint form. ¿Tiene alguna pregunta o queja sobre las actividades AAMPO? Si desea enviar una pregunta o queja con respecto a las actividades de planificación o programación del Área de Albany MPO (AAMPO), por favor, póngase en contacto con Dana Nichols at dnichols@ocwcog.org; o visitando las oficinas administrativas al local: 1400 Queen Ave SE, Suite 205, Albany, OR 97322. Si usted tiene una preocupación o queja relacionada con el Título VI de la Ley de Derechos Civiles de 1964, por favor visite nuestra página web Programa del Título VI para obtener información adicional y una copia de nuestro formulario de queja. Sign up for email updates on AAMPO by clicking HERE. AAMPO Policy Board will consider modifications to the region’s Transportation Improvement Plan (TIP) at the March 27, 2019 meeting. A more detailed explanation can be found in the meeting packet. You may also contact AAMPO Staff by emailing dnichols@ocwcog.org, or by calling 541-924-4548. 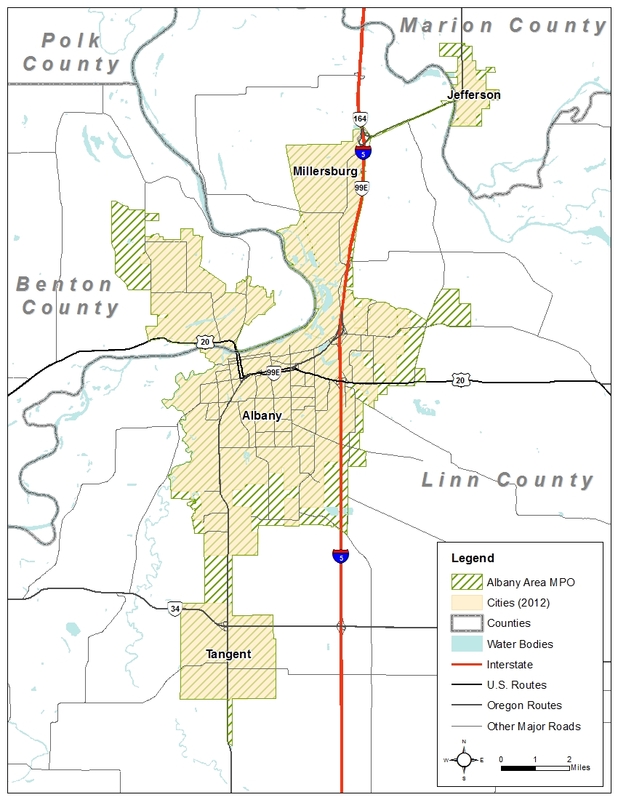 The Linn-Benton Loop Governing Board, AAMPO, and other partners are working on a Service Development Plan to provide short-term recommendations for service enhancement/expansion for the Linn-Benton Loop transit service. This Plan will help the Loop be competitive for State Transportation Improvement Funds, to better serve employees, students, and other commuters in the Region. The Plan is expected to be complete in spring 2019. Updates will be included on upcoming AAMPO meeting agendas, and the draft Plan will be posted here for public review in early 2019. Regional Transportation Plan (RTP): AAMPO adopted its RTP in May 2018 to guide transportation investments over the next 20 years. Click HERE to access the RTP. Updated AAMPO Demographic Profile: Please click HERE for demographics about the AAMPO Region, updated August 2018.